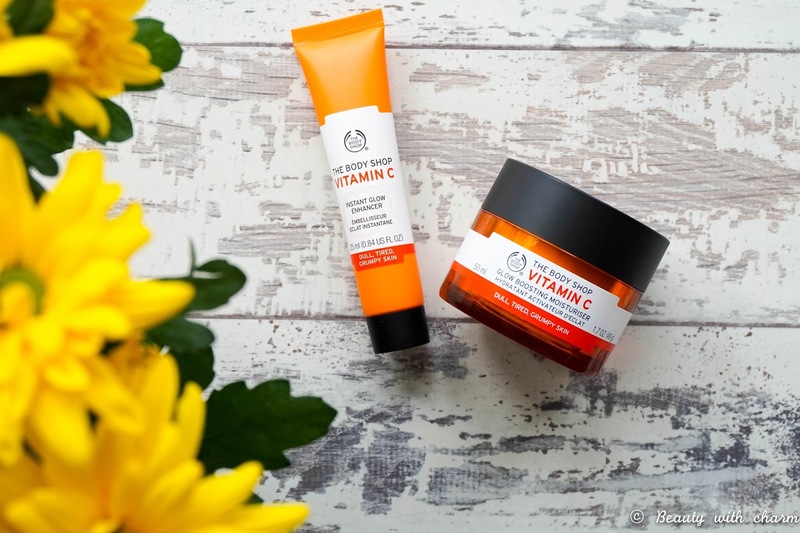 I'm just using my last few drops of the newest addition to The Body Shop Vitamin C range, the Glow Boosting Moisturiser* so I thought I would share with you my thoughts on this refreshing product along with the Instant Glow Enhancer* which I was lucky enough to receive at the #HappySkin event a few months back. My skin tends to be on the drier side of things & most of all it's pretty dehydrated on a regular basis so I am always looking out for nourishing or hydrating products to add back moisture to my skin, hence why I love the Vitamin E range. So of course I was a bit worried trying out this range as I didn't think it would be moisturising enough but I've been proved wrong (which I'm quite happy about for a change). First of all I love the bright packaging, as it manages to look fun but luxurious at the same time & second of all I love the fresh, zesty scent of both products. 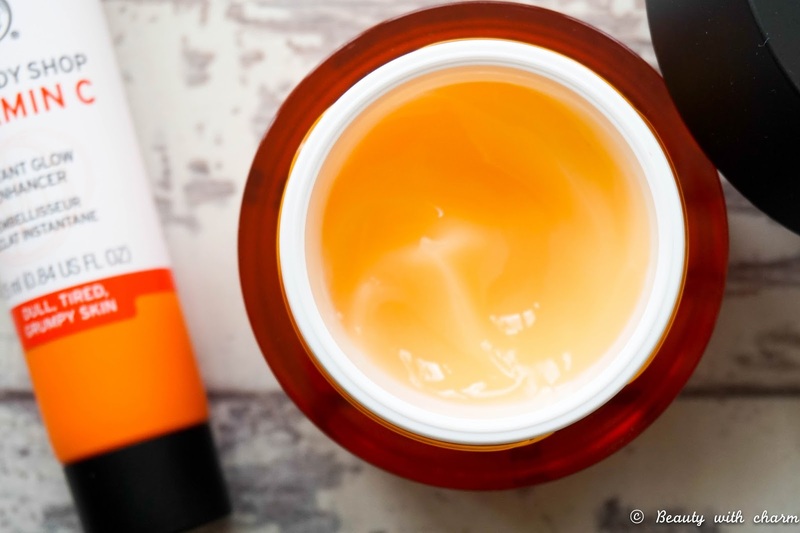 The moisturiser in particular has been an absolute pleasure to use in the mornings during the hotter summer months as it feels really cooling on the skin. I had no idea just how good vitamin C is for your skin & I have to say my skin definitely look brighter and more radiant since including these products in my routine. I don't get as much sleep as I should every night & the daily stresses of being a mother at times can take its toll on my skin, so it was great using these glow boosting products & seeing an improvement in the dullness of my skin. I especially love the motto 'dull, tired, grumpy skin' because that's exactly how I feel & look at times. 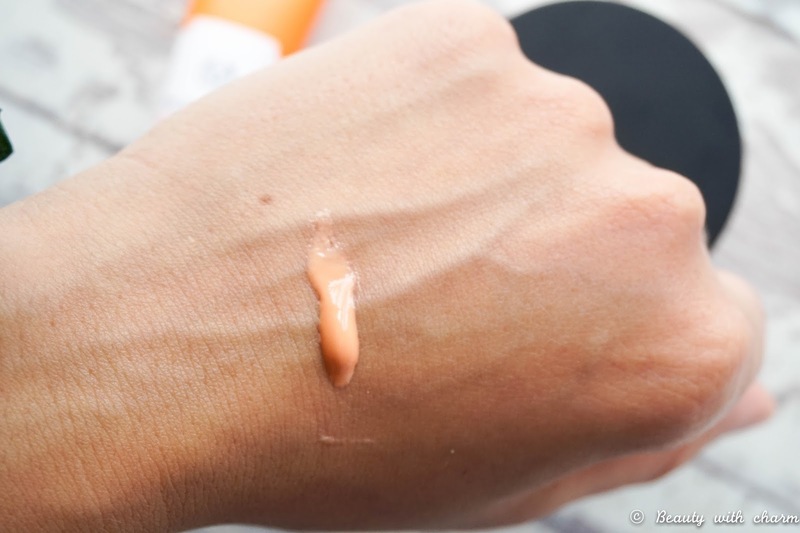 As you can see from the photo above the Vitamin C Glow Boosting Moisturiser has a gel texture but still provides the perfect amount of hydration throughout the day, especially now during summer when my skin is not as dehydrated. If you've got super dry skin I would imagine that it might not be enough moisture & you would have to pair it up with a super hydrating moisturiser. I personally pair it up with the Vitamin E Serum and it's the perfect combination. It's very similar to the more expensive Origins GinZing Moisturiser which I used a good while back & ended up disliking (it was winter & I wasn't pairing it up with a serum, so it didn't give my skin the much needed moisture). The best thing about this cream is that it's infused with Amazonian Camu Camu Berries which contain 60x more vitamin C compared to oranges for example. This is what helps to add life back into my dull skin, making it feel smoother & plumper at the same time. I've been pleasantly surprised by this moisturiser & even though I know it's not something I can use during the winter months I'm so glad I've been able to try it out & enjoy it during the hot (supposedly) summer months. The other new addition to the Vitamin C range is the Instant Glow Enhancer which is supposed to be used under or over makeup to add a glow to the skin & brighten up a dull complexion. I personally use it after my moisturiser like you would use a primer because I never remember to touch up my makeup throughout the day. 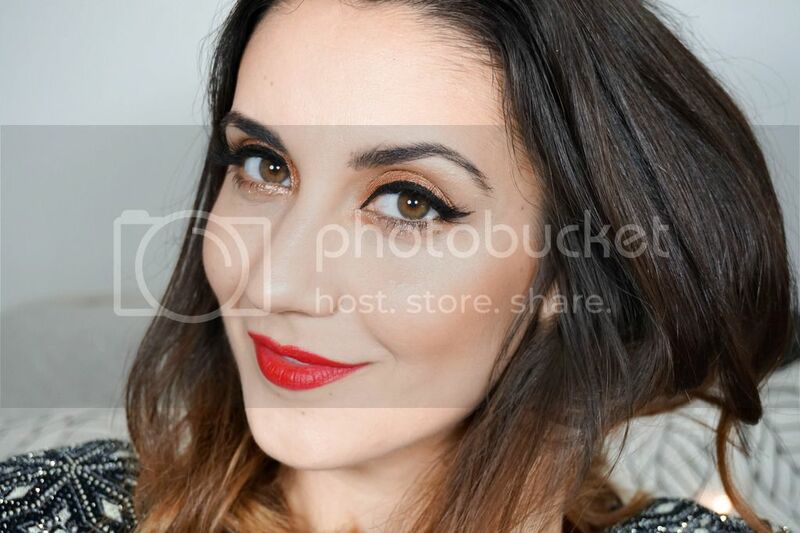 The peachy tone to it doesn't show up on the skin at all but rather colour corrects any dullness your skin may have and even helps tired eyes. I don't use this product as often as I should because I'm just terrible with primers in general but I like that it leaves a glowing finish to the skin but in a very natural way, no shimmer here (which is definitely a nice change compared to my usual shimmering liquid highlighters). I definitely need to include this in my makeup routine more often & even try it out throughout the day on top of my makeup to see how it feels. The only negative thing I could say about both products is that they don't have any SPF included which is a little bit strange considering they are considered summer skin essentials. It doesn't bother me too much as I usually prefer to use a separate facial SPF, now more so than ever after reading one of Caroline Hirons articles on the topic. But it's definitely a point worth taking into consideration if you're thinking about purchasing the duo. 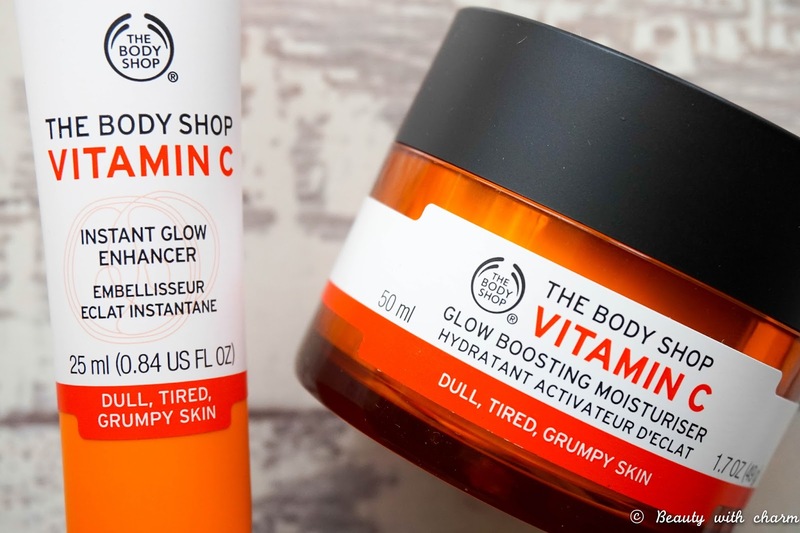 Have you tried The Body Shop Vitamin C range yet? Would you be interested in trying out these latest additions?